On 1 March 2019 a ceremony was conducted at the Royal Australian Navy Memorial, ANZAC Parade, Canberra to mark the Australian Navy’s 118th Birthday. The program of events included a Birthday address by Vice Admiral Michael Noonan AO RAN, Chief of Navy and a Navy Birthday Reading. These are reproduced below along with a historical retrospective on the RAN in 1919, 100 years ago. The birthday greeting was written by Mr John Perryman, Director of Strategic and Historical Studies, and delivered by Able Seaman Brooke Atkinson. The retrospective was written by Mr Greg Swinden, Senior Naval Historical Officer. As a Nation and a Navy, we gather to acknowledge the 118th anniversary of the establishment of the Royal Australian Navy – our Navy. On 1 March 1901, the States transferred their naval and military assets, their Sailors, Officers and Public Servants to the Federal Government. Today, we give thanks to all who have served our Nation in our Navy. The qualities shown by those who have gone before us, lead us to strive to embody our Navy Values of Honour, Honesty, Courage, Integrity and Loyalty; these values underpin our Australian Navy. Since 1901, the Royal Australian Navy has continually demonstrated that when called upon by the Nation to ensure Australia’s growth. prosperity, and security- whether at war or in times of peace – we have been ready in all respects to take up the challenge. Our Fighting Navy is improving capability to be more lethal, agile and able to fulfil the tasks required of it now and into the future. Our Thinking Navy can adapt to the ever- changing strategic environment; it is a leading edge and integrated maritime force. prepared for the scenarios in which Australia may find itself during the 21st Century. Our Australian Navy is part of a truly national enterprise, where every sector of the Nation. from industry, education, research and development, finance. government and the broader community, work together for the good of our Nation. Together, we will deliver our future force. We continue to remember and honour the legacy and history of 118 years of our Royal Australian Navy. Thank you to all who have served and continue to serve in our proud Navy. In 1901 a nascent Australia was looking ahead to securing its frontier – the sixth largest coastline in the world, encompassing three great oceans over which all seaborne trade, in and out of our country, must pass. The security of those oceans and seas for Australia’s prosperity was understood by our earliest naval thinkers, admirals, politicians and citizens alike, who recognised the requirement for a strong and versatile Navy to serve and protect Australia and its broader interests. While celebrated as the Australian Navy’s birthday, the first of March 1901 was in fact the essential inception of a 12-year gestation, culminating in the arrival of the Australian Fleet Unit in October 1913 .. Less than a year later, the Royal Australian Navy would find itself at war but ‘in all respects ready’. Since then, 2658 members of our Navy have made the ultimate sacrifice defending Australia’s interests in warlike and peacetime operations across the globe. Today, as we celebrate our Navy’s birthday, we also remember them. As we look forward: Australia’s reliance on the sea remains vital to our future and we find ourselves in the midst of another period of gestation as the Navy and the Nation work towards completing the modernisation of our fleet, establishments and supporting facilities to face new and unknown challenges. Birthdays are important occasions and while we should not bury ourselves in the past. we should concentrate on what is at the heart of the celebration. Today we can be thankful to those who advocated for an Australian Navy and in particular we give thanks to all who have served, and continue to serve, in it, and those family and friends who support and enable us to do what we do so well. The guns had fallen silent on the Western Front and the soldiers were coming home. Many of the Royal Australian Navy’s ships would also soon be heading home after four long years of war – but there was still work to be done. 1919 began with the RAN continuing to conduct operations. The cruiser HMAS Brisbane was alongside in Izmir (Turkey) having completed operations in the Black Sea with the Royal Navy, supporting the White Russian forces against the Bolsheviks. She sailed on 4 January and headed to England to join HMA Ships Melbourne and Sydney, six Australian destroyers and the battle- cruiser HMAS Australia, undergoing maintenance after hard service in the North Sea and Mediterranean before returning to Australia: a country many of the sailors had not seen since 1914. In Australia, the cruiser HMAS Encounter was completing a period of quarantine having returned from Samoa and Tonga. The Cruiser had provided critical medical support following an outbreak of Spanish Influenza in December 1918 that killed a quarter of the population in both locations. Australia was not to be immune from this disease, brought to our shores by sailors and soldiers returning from Europe and claiming over 15,000 Australian lives. In Sydney, HMAS Sleuth patrolled off the North Head Quarantine Station to prevent returned soldiers from escaping before the end of their quarantine period. In Bass Strait, the RAN Reserve-manned minesweepers Coogee and James Paterson, supported by HMAS Protector, continued to search for mines laid by the German raider Wolf in mid-1917. 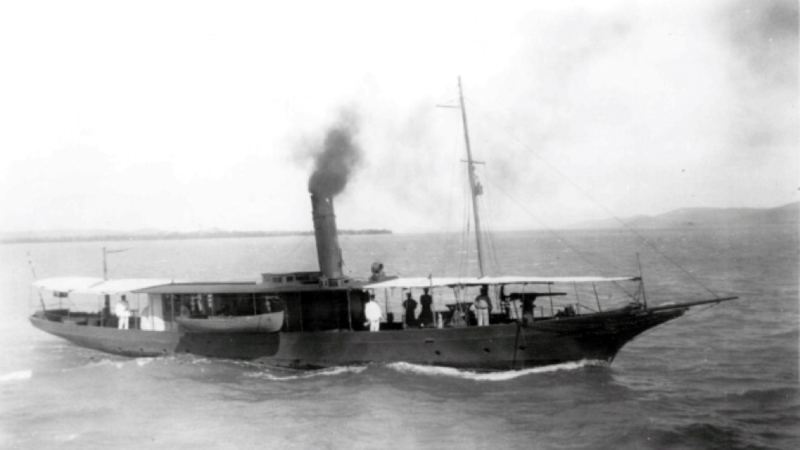 In Darwin, HMA Ships Una and Encounter were sent to restore order in the aftermath of the ‘Darwin Rebellion’ – a riot by members of the Australian Workers Union: and members of the RAN Radio Service continued to support the Australian Army Tropical Force providing essential communications duties in New Guinea. The first of the returning ships began to arrive in Australia in May 1919 but the return was marred by a mutiny on board Australia while alongside in Fremantle on 1 June. Fremantle was the first Australian port on her return journey and her crew were welcomed so enthusiastically that many of her personnel refused to take the ship to sea when ordered to sail. Five men were convicted of mutiny and sentenced to gaol sentences but after public outcry all were released in December 1919. HMAS Sydney also had an interesting return journey to Australia. She arrived in Singapore on 6 June but her departure was delayed, On 19 June riots broke out in the Chinese quarter and Sydney put a landing party ashore to assist with restoring order. Sydney then headed to Penang, where similar riots had broken out, landing armed patrols on 25 June to restore order. She eventually arrived in Sydney on 18 July 1919. Also, among the ships returning to Australia were the submarine depot ship HMAS Platypus and six J Class submarines – the latter a gift to the RAN that had lost its two E Class submarines on operations during the war. On arrival in Australia many of the war-time personnel were demobilised and returned to civilian life. By December 1919 all the ships of the RAN were back in Australian waters and the RAN continued to recruit new personnel, train for war and keep its ships ready to sail: when and as required.